In general, you work with an individual account by using the Quicken 2012 register window. You enter account transactions in the register. 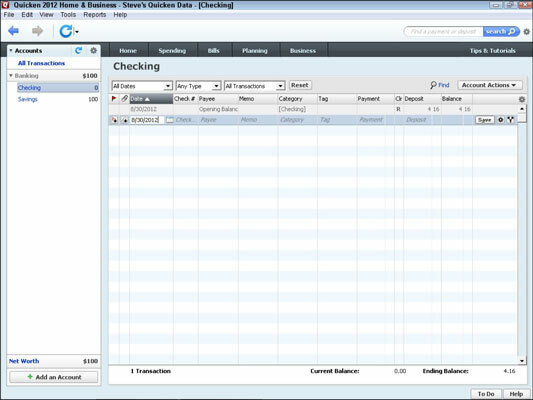 Entering transactions in a register is the basic, Quicken record-keeping task. In Quicken, you work with one account at a time. The logic is simple: You record income and expenses for a particular account — a specific checking account, savings account, and so on. That makes sense, right? Here’s another thing you need to know about working with a particular Quicken account. You use the Accounts bar, which appears along the left edge in the Quicken program window, to tell Quicken which account you want to work with in a register window. To use the Quicken Accounts bar, you click its hyperlinks. In other words, select the account you want by clicking the account name. Quicken displays the register window for that account. You can collapse and expand the Accounts bar by clicking the small button marked with a plus symbol or a minus symbol that’s just left of Accounts. If the button shows a minus symbol, clicking the button collapses the Accounts bar. If the button shows a plus symbol, clicking the button expands a previously collapsed Accounts bar.